These are lyrics by Kix that we think are kind of repetitive. 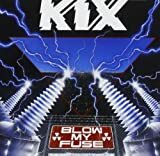 Kix's, "Don't Close Your Eyes"
Don't sing your last lullaby. Or what? He's gonna kill her?? ?